Mobile disc jockey service specialized to fit your needs for any special occasion. Energetically serving with competitive rates and quality service. Mark (our DJ) has got to be the best DJ in Minnesota! 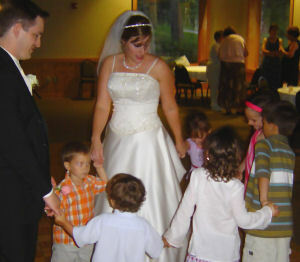 Out of all the parties and receptions I have ever been to, my wedding reception/dance was the most fun I have ever had! I have to attribute it to our luck in getting Mark to do the entertainment. I have had many comments from people attending saying the same thing! Great music selection, very entertaining! Thanks so much!!!!!!!!!!!!!!!! Mark did such a good job at my wedding reception; my sister booked him for her wedding reception after seeing what a great job he did at mine. Another job well done! We couldn’t have asked for anything better. The flow of it and the way you kept everything going was great. You followed what we wanted perfectly. Out of everything that had to do with our wedding, having you for our D.J. was our easiest choice. We knew we could take our minds off the music and just let you do it and have fun. You were our only choice. We love you!